On Saturday, March 10th, Event Chair Seta Eskanian gathered Armenian Bar members and friends together in Boston and Los Angeles for the Young Lawyers Committee’s inaugural event. Over a hundred guests joined in welcoming the newly formed group organized by Armenian bar members from across the country, who are dedicated to providing entries into public service and stepping stones towards professional development. The Young Lawyers Committee’s overarching efforts include connecting members from coast to coast, planning networking conferences, continuing legal education workshops and panel discussions of interest to the Armenian community. Attendees gathered together to mingle with this dynamic group of attorneys and local dignitaries, including keynote speaker, Marsha Kazarosian and special guest, State Senator Joseph Boncore of the First Suffolk and Middlesex District. Ms. Kazarosian, a nationally-recognized attorney from Massachusetts who is notable for handling high profile cases, including the precedent-setting multimillion-dollar gender discrimination verdict closely watched across the country against a prestigious country club in Massachusetts, addressed members in person in Boston and live on screen using a webcam to connect to Los Angeles. As she mentioned during her speech, that was the quickest she ever got to California. Ms. Kazarosian spoke about her bar involvement with the Armenian Bar Association, her former role as president of the Massachusetts Bar Association, Massachusetts Academy of Trial Attorneys and the Essex County Bar Association, and how it shaped her into the attorney she is today. She explained how bar association resources provide guidance, services and benefits that enhance one’s practice and enriches people’s experiences in the legal field. Senator Boncore discussed how coming out of law school, he joined many law associations and his involvement helped him find his way as a public defender and later learned that he was motivated to tackle criminal justice reform from a different position as State Senator. That is when he took a chance in 2016 and ran in the special election for the open First Suffolk and Middlesex state senate seat and beat seven other candidates. He attributes his success to the many connections, resources and benefits his bar memberships provided him. On a Saturday night, Senator Boncore explained that the attendees could have been anywhere else, but instead they were networking, connecting and expanding their horizons by attending this event. Ms. Kazarosian was impressed with the turnout and mingled with a room full of young professionals who she says are destined for extraordinary things. The Young Lawyers Committee encourages law students and attorneys in their initial stages of their legal careers to join the association and become active and engaged in its upcoming events. Their plan is to keep the momentum going and to continue to host events from coast to coast. Three members of our firm, Jeniffer A.P. Carson, Seta Eskanian and Seta Pioli, are of Armenian descent and are very involved with their community and volunteer their time and efforts to host several charitable events. An Armenian network connected them years ago and today they stand together to support one another’s career achievements. 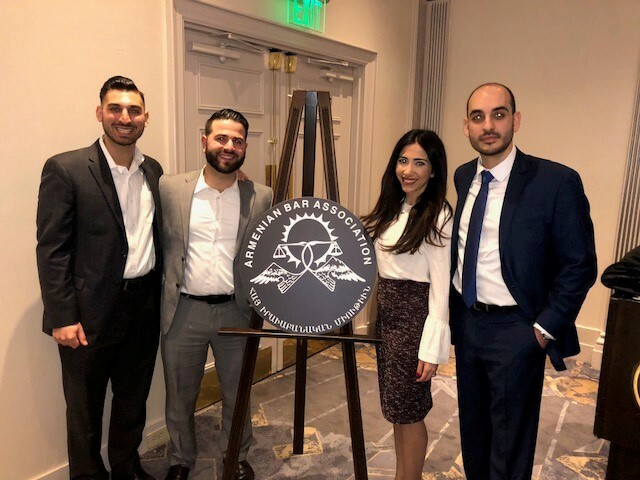 CMBG3 Law proudly supported the Armenian Bar Association Young Lawyers Committee’s Inaugural Event and the firm was happy to see how successful an event it was.